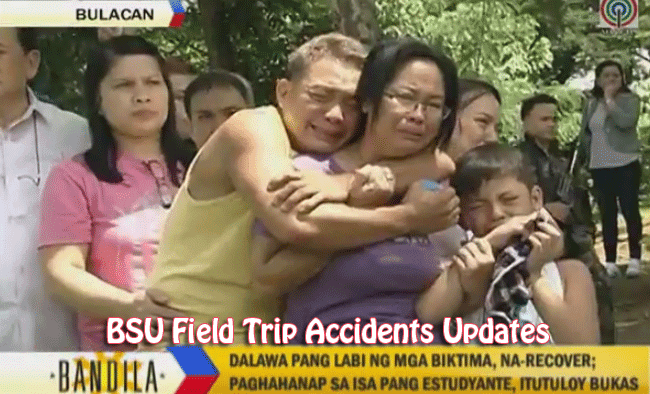 Bulacan State University (BSU) Field Trip accident resulted in 7 dead students who were drowned while crossing a river due to flash floods last Tuesday, August 19, 2014. The BSU Field Trip is related to tourism course school activities. Those drowned students were crossing the river from Madlum Cave when they were suddenly carried away by raging floodwater. Based on Abs-cbn reports, the latest death count from the accident during a student field trip now rose to seven (7). Those students who survived on the flash floods were traumatized and the families of the victims were mourning. It was Tuesday afternoon when the dead bodies of Helena Marcelo, Mikhail Alcantara, Michelle Ann Rose Bonzo, and Phil Rodney Alejo were recovered. Authorities said as reported on the news, the recovered body of Jenette Rivera was found around 10 a.m while Madel Navarro’s at 2 p.m of Wednesday. The following day August 20th, Maiko Bartolome’s dead body was recovered. In behalf of CenterTechNews, we extend our condolences to the family and friends of Helena Marcelo, Mikhail Alcantara, Michelle Ann Rose Bonzo, Phil Rodney Alejo, Jenette Rivera, Madel Navarro, and Maiko Bartolome. May you all rest in peace and may justice prevail if there was at fault at the BSU Field Trip Accident. Related: See Last Photos of BSU Students Before Drowning here.